In fights, you're almost always outnumbered... at one point, 50 to 1! I mentioned that the environmental graphics are astounding, and that they give you this wonderful sense of immersion in the game world. However, there is a drawback to the level of detail in the game. First of all, there's a bit of slowdown when you have too many NPCs on screen, or when you run into a new part of a town. This is a relatively minor offense, since the slowdown doesn't really affect the actual gameplay; it's more of an annoyance. The biggest drawback comes when you start encountering other characters in the game. In towns or streets with a lot of buildings or characters, any character more than, say, 15 feet away from you vanishes into thin air. Sometimes, you'll see a character in the distance gesturing and waiving her arms. As you walk closer, you'll see her conversation partner phase into existence, gesturing back. Shenmue has an impressive drawing distance for the buildings in any given part of town, but as a result, it has to drop out characters who aren't within your immediate field of vision. This wouldn't be such a big problem, but Sega has put so much effort into realizing a complete and engaging world that these little graphical quirks really stand out. One second, I'm walking the streets of Dobuita, then the next second, I see someone slowly fade into being, and all of a sudden, I'm back, sitting in front of my TV, playing a game. So much for suspension of disbelief. The gameplay can be a bit formulaic, in a classic adventure-game sense. Much of your time is spent finding people, gathering information, and running errands for other people in order to get them to help you. In an interesting variation on the formula, you often have to adjust your schedule to meet with people when they are available. Time plays a big role in defining how you play the game. You have appointments to keep, and missing an appointment can often cost you a bit of waiting for your next chance to meet someone (thank the gods for that arcade -- there's no better way to idle your time away). As a result, the pacing of the story seems weak at times. You wander around, waiting for your next story cue, and anxious for your next fight. Sega could have tightened up the storytelling a little bit and given the players more direction in pursuing the plot, but this would have infringed on the free-roaming exploration of the game. And like I said, there's always the mini-games. The controls, which are pretty responsive in Free Battle, become frustrating during the exploration mode. I found myself turning all the way around accidentally when I was trying to work my way up a staircase or navigate a tight alley. By that same token, the camera angles were a bit frustrating sometimes -- the camera might clip through a building, or obscure your view of regions on the screen that Ryo should be able to see. When in Zoom mode, in which you use the analog stick to control the camera, I wanted to be able to switch the camera to use flight controls (up looks down, and vice versa), but there was no way to change this control. This is merely frustrating, since you will ultimately get accustomed to the nuances of the controls, but it still got in the way of my experience. Finally, I need to comment briefly on the translation. I hesitate to put the writing firmly in The Bad, but there are some recurrent problems throughout the game. First of all, the grammar on the subtitles is pretty mediocre. Fortunately, the dialogue is spoken, so you don't need to rely too heavily on the subtitles to figure out what's going on. Instead, you can listen for tone and inflection to get the idea of whatever a character intends. Unfortunately, the voice actors are pretty much toneless and flat, with the notable exceptions of Iwao, Ryo's father, Lan Di, his murderer, and Chai, the freakish, cackling man-beast that pursues you throughout the game. Other than that, most of the characters' voiceovers are passable, but not very lively. The worst offenders are the hideous, dead voices of the children; their playful laughter chills my heart with terror. I hesitate to include this in the normal Good/Bad section, but it doesn't directly influence the game, per se. It's more like all the extras you look for on a DVD. Sure, you want a DVD to have trailers, bonus materials, stuff like that, but not having them doesn't make the movie worse. The Shenmue Passport serves roughly the same function, not really changing the basic game, but adding a little bit to the experience. There are four basic options: Information, Theater, Music, and Passport. The Information option takes you to what amounts to elaborate technology demos disguised as tutorials. Talking-head versions of seven of the characters stare blankly into space reciting gameplay features at you. While each tutorial has predetermined camera direction, you can seize control and move the camera, lighting, and zoom distance to a limited extent. Mostly, these are attractive, modestly interesting explanations of the game's various features -- really, only Chai's tutorial (on QTE) has anything interesting to offer: Chai's typically overacted voiceovers and some wacky camera direction. The Music and Theater options let you access music (obviously) and movies you've unlocked in-game. You can also view some bonus promotional movie trailers. These all are nice additions, but, as the name implies, the Passport option forms the real heart of the Passport disc. 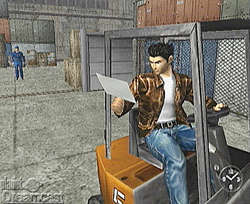 You can view information about the places and characters seen in Shenmue. You can view the background on each fighting move Ryo learns. However, this is still in the realm of adding more trailers to the DVD: it gives you a little background, but it doesn't affect your actual game in the slightest. The Passport does add a little more life to the game itself, though. You can find hints for puzzles, you can post your name on a rankings board, comparing your mini-game scores with those of other players. You can view "cumulative data," a sort of stats page detailing game information, like how many battles you've fought, how many sodas you've bought, and so on. There's a section called Everybody's Space, wherein you can check the weather forecast, trade items with other players, check up on Shenmue news, and trade in winning soda cans. That's right...Some soda cans you buy in vending machines may win you a special prize. You can redeem those cans online and download a special item to your VMU. All of these are nice features, but they're really just icing on the cake. I love this game, but I can't say that everyone will. The story's pacing is a little slow; it takes a lot of patience to work your way to the real action (in fact, most of disc one is just conversation and exploration; most of the real action comes at disc three). The controls are a little weak at times, and the camera can be downright frustrating. On the other hand, Shenmue provides drama and a good story once you get involved in it. 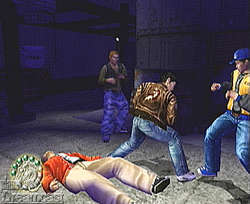 The mini-games are a blast (just the retro-arcade games alone make Shenmue worth a look). Most importantly, Shenmue feels like something new, and it contains within it a promise of greatness to come. I hope Shenmue does well, because I need those other chapters. Shenmue may not be the summer blockbuster of video games, but if you long for something new and interesting, Shenmue is well worth the time. Highs: Wonderful immersive qualities, interesting story and setting, great graphics and sound, fun minigames. Lows: Character pop-in, somewhat annoying controls, shoddy translation and voice acting. Other: 1 Player, VMU compatible, Jump Pack Compatible, VGA Box Compatible, Modem Compatible.